One of the reasons The Simpsons has endured for so many years is its deep bench of characters that can be called up to shoulder the heavy lifting of any particular episode. The Star Wars universe has a similarly diverse and beloved cast, and the Star Wars comic is at its best when it sloughs off any need to be connected to a larger continuity and just concerns itself with featuring the characters we love in new and exciting adventures. 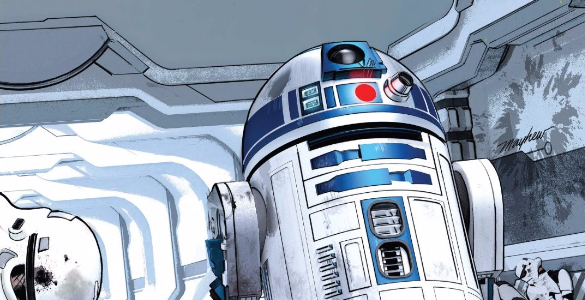 In Star Wars 36, writer Jason Aaron sends R2-D2 off on his own deep into Imperial territory to rescue C-3PO. It’s a simple idea that’s carried off by our inherent love of the rascally astromech droid, and it’s the kind of story that serves Star Wars best. Taken on its own, I’m not even bothered by the rehashing of — er, nod to — the end of A New Hope, with R2-D2 piloting a ship with Darth Vader close on his tail and Luke and Han swooping in at the last moment to lend him a hand. In the context of a greater connected narrative weaving between iconic films, such repetition of familiar beats only works to undermine the idea that the universe outside of the Star Wars films is worth exploring. But in a stand-alone story, Luke and Han showing up is like when sitcom characters used to cross-over to other shows. Cheesy? Of course. But comforting at the same time.